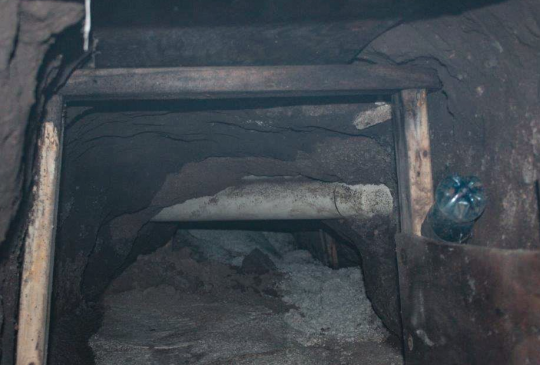 Border Patrol agents foiled the construction of a cross-border tunnel for smuggling contraband that was discovered Monday during a tunnel sweep in cooperation with Mexican law enforcement. The tunnel was about 50 feet long and 2 feet wide by 2 feet tall, and while it was incomplete, it was apparently designed for smuggling, the Tucson Sector Border Patrol said in a statement. Most of it, about 44 feet, was on the U.S. side of the border. "Tucson Sector Border Patrol continues to work closely with strategic partners in Mexico to detect tunnels under construction to prevent the movement of illegal contraband or persons across the border," U.S. Customs and Border Protection said. The two cities of Nogales, in Arizona and Mexico, have an international waterway for controlling flooding, and the tunnel's entrance was submerged under it. The tunnel ended underneath a parking lot, its exit not yet constructed and structural shoring and digging tools lying inside. Authorities plan to fill the tunnel with concrete. Hernandez could not immediately provide the most recent statistics, but the Border Patrol has said in the past that since 1990, more than 173 tunnels had been found along the border, with about 103 of them discovered in the Nogales area. The tunnel will be monitored while authorities prepare to fill it in. "Agents will continue to monitor and inspect the incomplete tunnel until it is properly secured and remediated with concrete filler," Customs and Border Protection said. This entry was posted in National Security and tagged Arizona, Border Patrol, Drugs, Mexico. Bookmark the permalink.